What if Samsung had made the Galaxy S9 with a notch? Samsung's Galaxy S9 is the hottest Android you can buy at the moment, but you know what would make it even hotter? A notch! Nah, we kid, and you are of the same opinion, but if you want to look how the Galaxy S9 would have looked like if it had a notch instead of the smooth and uninterrupted top bezel it has now, look no further than Martin Hajek's renders below. Copycat legalities aside, the "notch" allows a manufacturer to boast extremely high screen-to-body ratios. The new Asus Zenfone 5 boasts 83.69% of it in our benchmark calculations, which is a bit higher than the iPhone X's 82.35%, as the Zenfone has narrower notch. Still, the Galaxy S9, which sports an oldfashioned uninterrupted, but very thin top bezel, beats them both with 84.36%, and only gives way to the Essential Phone's 84.85%, but this one has the most minimalistic "notch" of them all. What do you think, yea or nay? Surprisingly, it looks hideous. I say this as one currently using an IPhone X. If may grow on me like the X, but this render is hideous. The frame on the IPhone is what makes it look okay. All notches are hideous, period. The notch brings nothing but a useless cutout. Especially when apps have to be modified in order to use the few pixels on either side. Apples notch is by far the worst of the bunch, especially when the majority of the top is for the cameras, sensors, and speaker with only a few pixels on either side. There is so few pixels on the iPhone X that there isn't enough room for a battery percentage. Yes phones with notches does looks hideous. But if Samsung did went with the notch for S9 I am sure PhoneArena will call them out copycat even tho Samsung had a drawing of notch way back 2014. Samsung knew how it would look weird so the stay with the black bar instead. PhoneArena tends to leave off the part where apps have to be modified if they want to take advantage of, or use the few pixels on either side. That is why Apple will reject any new apps that do not support the iPhone X notch. Just completely dumb. Most knotch gators reasoning is flawed. It’s not screen takin away. It’s screen added to a otherwise blank area. It’s covering everything you can with screen and that’s a good direction. Actually it's brand bias that makes the notch look okay to you. You overlook it on the iPhone X because you like Apple, on a different brand phone with a similar notch you don't like it because it's not Apple. I'm neither a fan of Apple or Samsung and the notch just looks horrible on both, hell on any phone that uses it. The phone on which the notch bothers me the least is the Essential Phone. 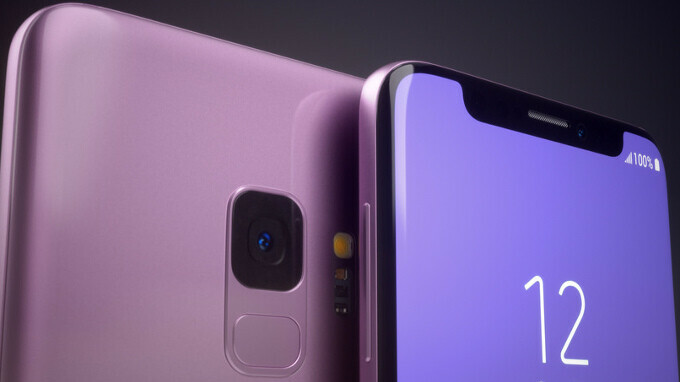 I'd personally forfeit the front facing camera rather than create a phone with an ugly notch. Vivo's Apex concept may be the best alternative until the technology to embed it under the screen comes along, but I doubt we'll see that before 2020 despite claims saying that Apple wants to eliminate the notch next year. ACTUALLY, speak in your name, there are a lot of people who love or are being neutral about the notch. For me personally, it's a interesting design choice, it makes my phone look different than the Samsung line-up for example. And I also have a lot of friends (who have the iPhone X) that don't think it's ugly. We're allowed to have opinions, aren't we? Your opinion is, but speaking for your supposed 'a lot of friends with the iPhone X' which is highly unlikely, we'll just leave those out shall we? But what you say about the notch being an interesting design choice and how it makes it looks different from the rest, does seem to have become the go-to response when it comes to iPhone X owners opinions, it suggests more of a forced tolerance rather than an actual love. That's my opinion and probably closer to the truth than your opinion. I don't hate Apple, I just think their products are ridiculously overratedand overpriced and that's speaking from experience and that includes the iPhone X. I bought my girlfriend one about 2 months ago on the condition I got to use it for two weeks first. FaceID is a big meh and the notch after two weeks I still found it an annoyance, plenty of apps still haven't found a good way to work around it. The company I work for attempted to switch to OS X years ago and all the remaining Macbooks now as a standard run Windows due to compatibility issues with production software at our factories which are all Windows only. Our business advisors used to visit clients with iPad in tow, but often ended up resorting to their laptops because of issues that iOS had with the cloud services, more often inaccessible than accessible. Nowawdays they use Surface tablets or similar devices without issue. So it's not that I hate Apple, I just know it doesn't all just work contrary to what Apple would like you to believe. But hey, my girlfriend loves it and I'm probably gonna buy an Xperia XZ2 Compact. The notch is ugly no matter which phone it is on. Quit making up excuses for Apple. It just shows how delusional you are towards a brand, which is pretty sad. And you guys wonder why most of us say that you are sheep -- that you would buy a turd with an Apple logo on it. You've given your soul and power to Apple and they are slowly screwing you out of your money for it. They know you will buy their crap, no matter what they do. Hell they glued together cheap components in a laptop, replaced the function keys with a stupid touch bar, put a crappy keyboard in it, then charged you bozos $1500 for it and you made up excuses for it. Meanwhile, Samsung removed the microSD slot from the S6/Note 5. Samsung users revolted, causing Samsung to apologise and bring it back in future phones. Samsung/Android users aren't sheep, thus we have the power to get what we want in a device. Hahahah, I'll pretend I didn't read this. I'll just say, let's look at your comment from a different perspective, maybe you're giving too much "soul" hating on Apple, which, in case you would have been totally happy with Samsung, you wouldn't feel the need to express it, but you're not ('cause you know deep inside Samsung is the real crap). Less hate buddy and you'll be happier. Brand bias???!! I have owned in the past year S8 plus, Note 8 LG G6, Pixel 2 Xl and the iPhone X. Just because I think it looks okay doesn’t mean I am Apple loyalist. Also in the past I have owned windows phones (by far my favorites), Motorola, Asus, one plus and numeros others. You dudes with your personal biases claiming other to have bias are comical. At the end of the day you are right to your opinion. Looks are looks, and they are certainly in the eye of the beholder. However these notch cutout looks are just stupid, especially when apps have to be updated in order to take advantage of use the tiny few pixels you get to use. Not to mention Apple now rejects apps that do not support the iPhone X notch. Nothing like Apple forcing it's developers to support a cutout or notch. Talk about a communist ecosystem to support a stupid notch. Damn, so many experts in phone designs here. I'm impressed. Big companies should hire you in the design department of their flagships (I'm ironic). Just people who are entitled to their opinions, like you, as you so enjoy to point out. Yeah, very clever opinions, just like you are (I'm ironic again). The fact is you constantly pester others about respecting your opinion, but you can't bring yourself to do the same. That's called being a hypocrite. Clearly from you postings above you love Apples notch. That's great for you, but Apples iPhone X notch gives the least amount of display from the notch, especially if you compare it to other notched smartphones. The other thing that is stupid is Apple now FORCING it's developers to support the iPhone X notch. Any new apps will be rejected if the iPhone X notch is NOT supported. Samsung will definitely copy the notch with their next year's Galaxy S10. They always copy Apple no matter what. But they just need to show the world that they do not copy anyone, that's why they are delaying this notch copy. Lol this same goes for Apple as always Dual camera Stereo Speakers Wireless Charging Super Amoled Edge to edge display.... But you won't understand this. Butthurt as always??? they’d need to have a weird shaped display which would be very wasteful or there would be a bezel on the bottom because of how they need to fold the digitiser PCB.